Art of Animation is a large value resort located on-property at Disney World. There are two types of rooms at Art of Animation: Little Mermaid standard rooms or themed family suites. There are 3 types of Art of Animation family suites: Cars, Nemo, or Lion King. 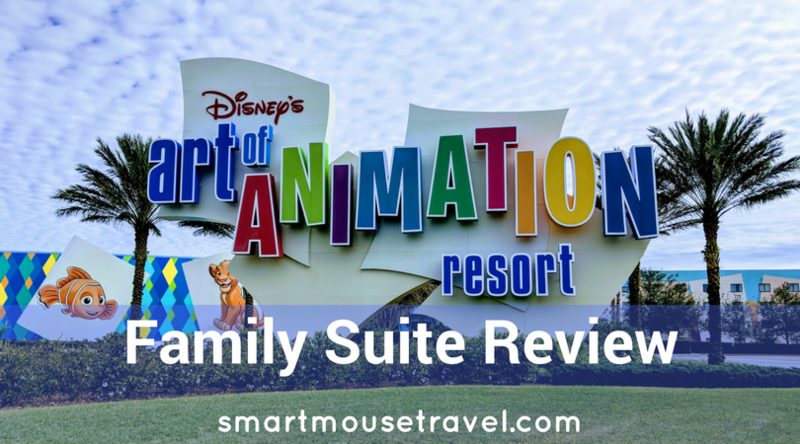 We opted for a stay in an Art of Animation Cars family suite for a one night stay prior to embarking on a Disney Cruise. Art of Animation is an ESPN Wide World of Sports area resort. Art of Animation has several hotel buildings located on-site and a central amenities building called Animation Hall. The food court, the Ink And Paint gift shop, and bus access are all in or near Animation Hall. 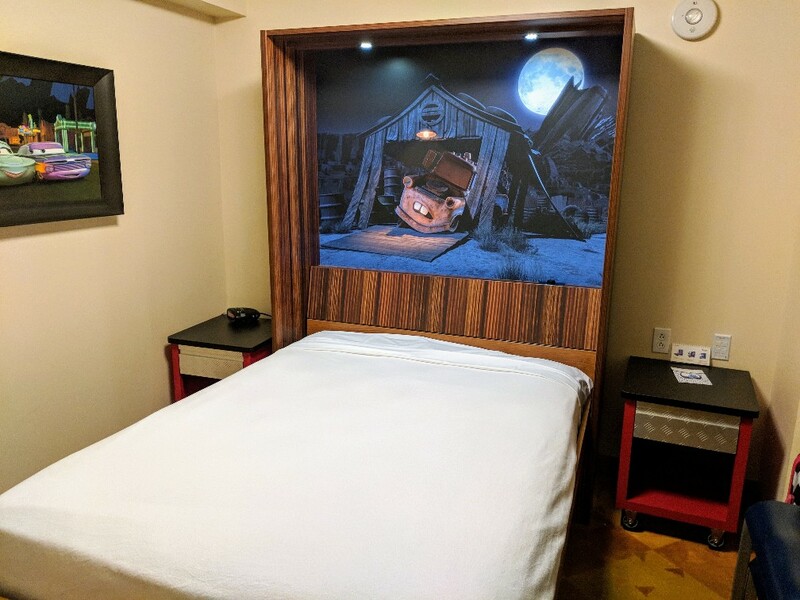 Animation Hall is located right in front of the Nemo family suites, and the location makes the Nemo suites a popular choice. 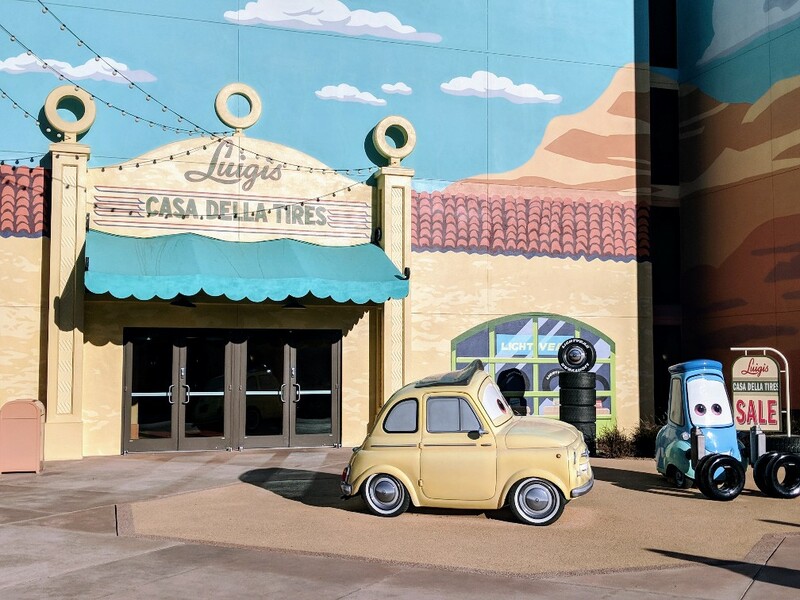 The Cars suites are a little further from Animation Hall, but even the furthest building was not more than a few minutes walk. The Lion King suites are a similar walk, on the opposite side of Animation Hall as the Cars buildings. The Little Mermaid rooms are the furthest away from Animation Hall and take several minutes to walk from the furthest Little Mermaid building to Animation Hall. No matter which building you are in you will enjoy the large Disney characters and movie scenes found along the walkways. I loved the chance to take pictures with our favorite Cars characters and the Cozy Cone Motel on our walks. Each themed section at Art of Animation has its own pool, making four pools total at the resort. The Big Blue Pool in front of the Nemo family suites is the largest of all of the pools. Landscape of Flavors is a large, multi-segment food court that serves breakfast, lunch, and dinner at Art of Animation. We ate breakfast and a light lunch there. The food options are nice, but the food quality we experienced was mediocre. I really missed having my grocery delivery from Garden Grocer this trip, but it didn’t make sense for a one-night stay before the cruise. Art of Animation offers a limited pizza menu that can be delivered to your room. 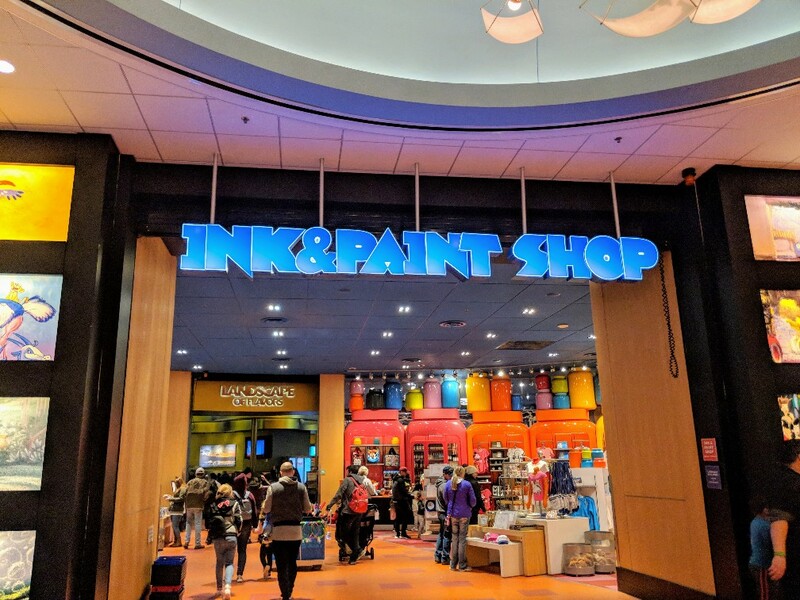 Ink and Paint Shop is the large gift shop at Art of Animation, offering the usual souvenir items and also pre-packaged foods (some of which count as snacks on the Disney Dining Plan). This was our first stay at a Disney value resort. 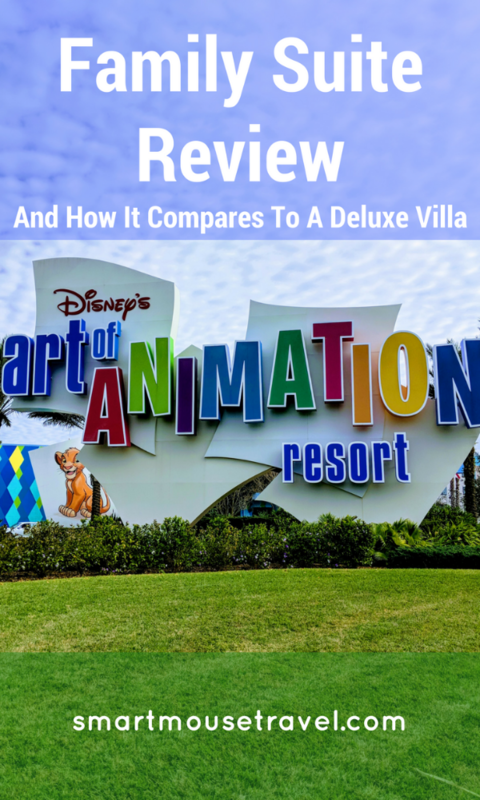 We’ve stayed at several deluxe resorts and villas, and I was interested in how an Art of Animation family suite would compare to a deluxe villa. When entering the suite there is a dinette table with four chairs available for meals. The table also doubles as a murphy bed. Just pull down on the handles on the wall attached to the table and voila you have a double sized-bed. The next thing I noticed was the kitchenette and living area. 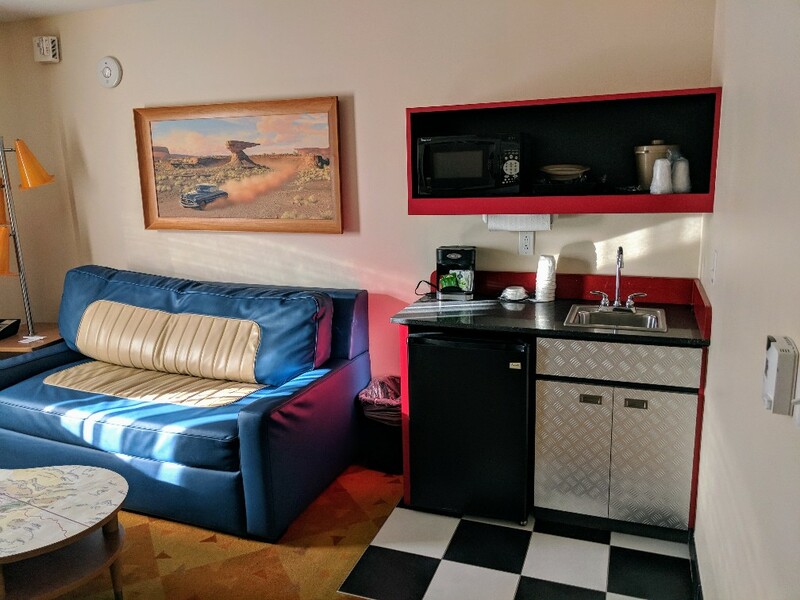 The kitchenette has a microwave, mini-fridge, coffee maker, and small sink. There are some basic supplies like coffee pods, paper plates, plastic utensils, and disposable cups on the shelf above the sink. The double-size fold-out couch provides an additional bed option for larger families. A full bathroom is also located near the living/dining area. This bathroom has one of my favorite features: the bathroom is split into two usable areas. The toilet and shower area are separated by a door from the sink. This allows privacy while two different people are using the same bathroom. The bedroom area contains a queen-size bed, TV, dresser, in-room safe and an en suite bathroom. My only real disappointment with our Cars family suite was that it was located directly next to the elevators which meant some late-night and early-morning noise. I would try to request a room away from the elevators for a future stay. Free in-room WiFi is available at Art of Animation. This WiFi will not allow you to stream video via Netflix or similar services, but it does work to check email, the My Disney Experience App, or social media. Art of Animation provides resort guests overnight parking for a fee of $13 per night. Access to Magic Kingdom, Epcot, Hollywood Studios, Animal Kingdom, Disney Springs, and all water parks is currently by Disney World bus on-site transportation. Bus transportation generally has longer waits (and feels slower) than other forms of transportation, but is the most common system across Disney World property. There is a new gondola transportation project currently in progress for Art of Animation, but it will not be operational for quite some time. When completed this gondola system will provide access to Hollywood Studios, Disney Springs, and Epcot for hotel guests. 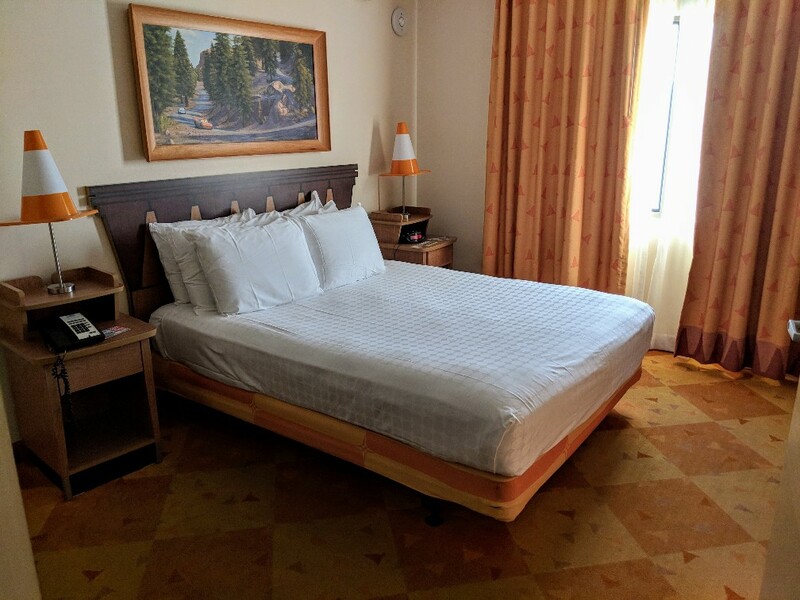 We have stayed at several places on-site at Disney World over the last few months (Beach Club, Bay Lake Towers, and Copper Creek Villas) which are all in the deluxe category at Disney World. I was intrigued by the look and layout of the family suites at Art of Animation, so we decided to see what this value resort had to offer. Our family loved the room setup, and I felt like it was a great value. 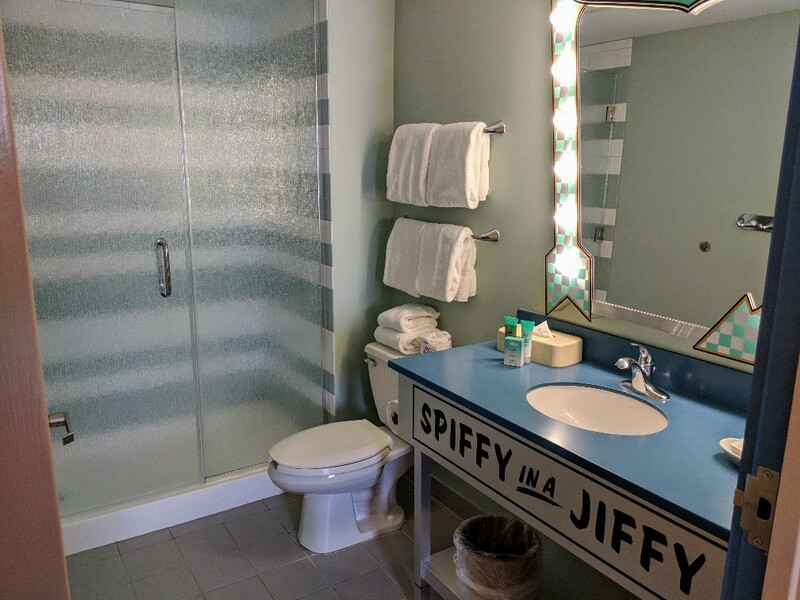 The Art of Animation family suite provides plenty of room, sleeping options, and two bathrooms. Even the one-bedroom deluxe villas usually have only one bathroom! The main drawbacks of the Art of Animation family suite versus my preferred deluxe villas were mediocre food options at Art of Animation and bus transportation to all parks. Many of the deluxe villas are within walking distance or a quick monorail trip to the parks, and buses at Disney are my least favorite mode of transportation on-site. I can absolutely see myself staying at an Art of Animation family suite again. I felt that the room quality, size, and sleeping options were all great. 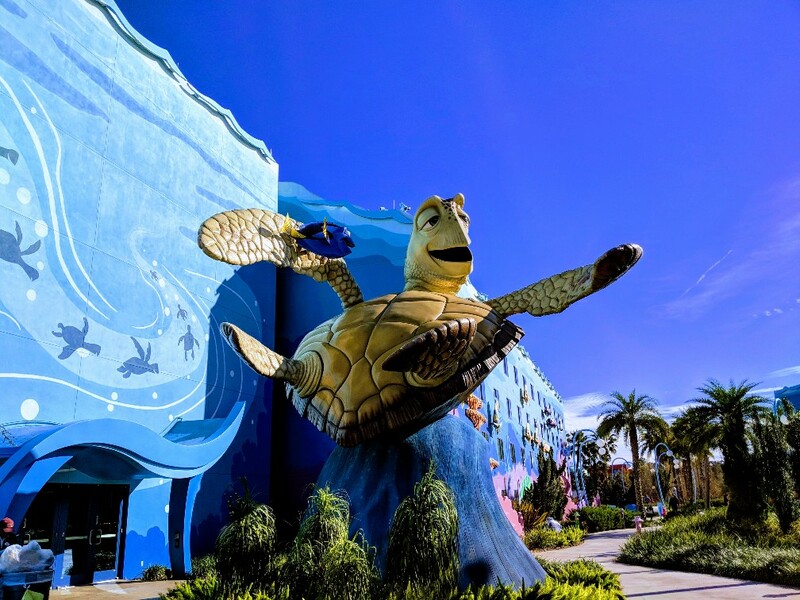 This paired with the lower price tag than many other Disney World resort options makes Art of Animation a great option especially for larger families. yeah we passed on art of animation for Port Orleans on our trip. Although Im not sure the food at PO was much better because we never ate there! They are also a bus service property – which my husband HATED! But the price is right esp if you are just hanging your head for the night. We stayed at the in an Art of Animation suite, and it was nice but not something we’d do again. A bus ride is pretty much standard, no matter which resort you stay at depending on where you want to go. While you can easily access the Magic Kingdom and Epcot from a monorail deluxe resort, you’ll still need to hop a bus to go to the Animal Kingdom or Disney Springs. And AoA is a LONG bus ride to the Magic Kingdom. It’s in the World of Sports Complex area, but many don’t know that the complex is on the edge of the Walt Disney World property. And the one dining area is a quick service facility. There isn’t a table service restaurant at this resort. There’s also no gym. The value resorts don’t have the amenities that you’ll get at a moderate or deluxe resort, but AoA suites aren’t in the value price end. They are more expensive than the moderates and only marginally less expensive than the deluxes. They’re also not usually included in many of Disney’s special offer programs, either, which can make them even more expensive than a moderate or deluxe. I think the suites at Art of Animation look so tempting! Thanks for sharing. I agree that food is important too. 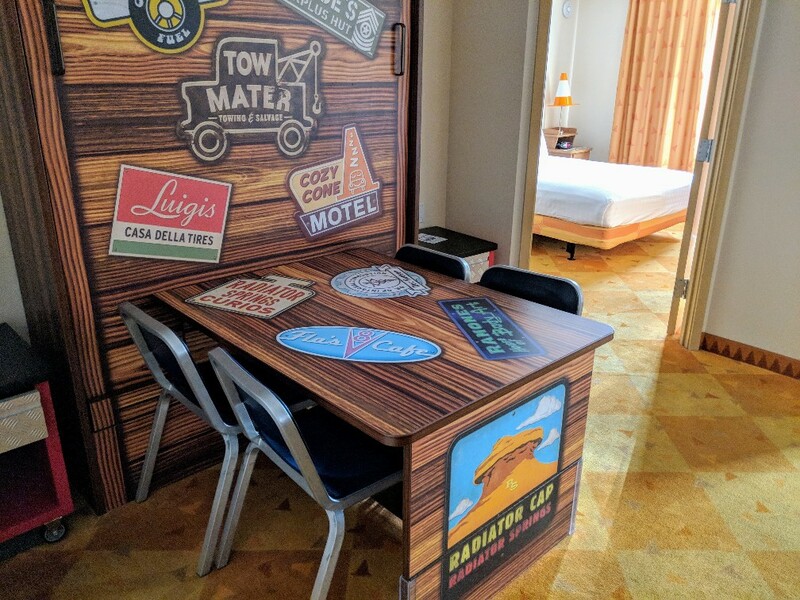 We are in the process of planning our trip to DW and we are trying to work out what hotel to stay at, Art of animation is one we are looking at as our kids love the look of the themed rooms. 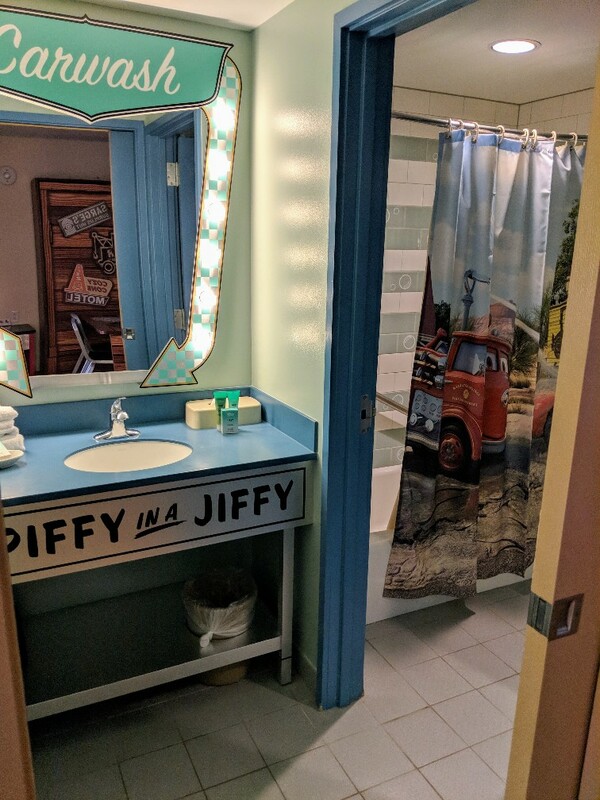 We enjoyed the Cars Suite here as well, but like you, really missed the food options and short commutes to the park that you get with a Deluxe stay. Great review! Thank you! 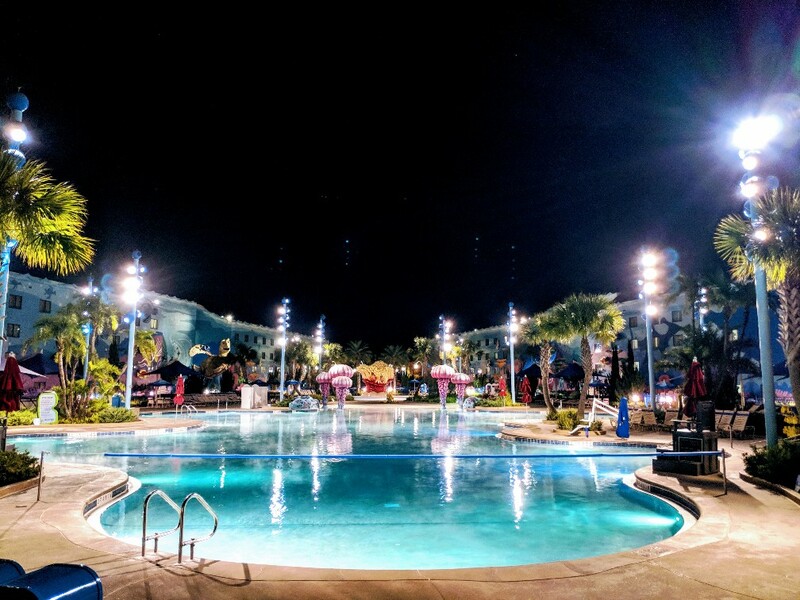 There are certainly trade-offs when staying at a value resort, but I think Art of Animation is an option worth considering. Great review. I haven’t stayed there yet, but it is definitely on my radar now. Thanks! I am considering the AoA family suite for my family of five. I think with the lower price tag, the amount of space given, and two bathrooms give it a full go for me! I hear that the food options are not great, and the travel is farther, but we aren’t planning on spending a lot of time in the room, honestly. About the kitchenette, I am getting different answers! Upon your stay, was your kitchenette stocked with disposable utensils, paper plates, bowls, etc? Or is this something we need to buy? Disney Mom’s website says yes, but Disney online chat and calling in both say no, this is very confusing! The food court was okay, but definitely unremarkable. You can walk to Pop Century’s food court from AoA for additional, but similar quality options. When we stayed at AoA our kitchenette had minimal supplies: a couple of disposable coffee cups, utensils, and plates. The overall space and having 2 bathrooms was really nice. Let me know if you have any more questions! Can I ask about the kitchenette in the AoA suites? I like having groceries delivered and eating in the room in the mornings. Does the mini fridge have a freezer in it? Is there a toaster like in the DVC studios? If not, is there a toaster available for public use in the food court? We like to have breakfast in our room, too! Our Cars Family Suite at AoA had a tiny freezer (where maybe an ice cube tray or two might fit). There was a microwave in the suite, but no toaster. I can not remember if there was a toaster or toaster oven in the food court, but that can be a long walk depending on which building your suite is in. I hope this helps! I have to say I thought the food was pretty good. It was better than the quick service options we had at Animal Kingdom Lodge, which was actually pretty good, and far better than the QS at both Grand Floridian and Yacht Club. Both the food quality and variety were better at AoA compared to those QS options. I know the deluxe also have good table service options, but they require a reservation – which means I can’t just go eat when I’m hungry – and are quite expensive. I don’t need to spend $100 for breakfast every day for a family of 3. While I LOVE the convience of the monorail locations and the styling of the deluxe resorts (particularly AKL), the bus service isn’t awful and my son lit up at entering the lobby at AoA, which he doesn’t do at all at the delux resorts. I’ve never stayed at a moderate, so I can’t really compare with those, but I am pleased so far (this is our first day at the resort). I’m glad you are enjoying your stay at AoA! I love the bright and fun decor around the resort, too. Thank you for sharing your thoughts on those different dining options. I think that is helpful for others considering a stay at AoA. The buses seem to run very regularly at AoA and Pop Century which we appreciate. I’m sure many people are excited for the addition of the Disney Skyliner this fall to provide another transportation option for the resort.